Rollovers are one of the most challenging issues for safety development. The detection of a rollover event is particularly complex. MGA has been performing rollover sensor evaluations for almost 20 years for a wide range of customers for global applications. The facilities and systems have been refined through years of industry testing and development – because of the collaboration between our test teams and internal equipment group, MGA has developed facilities unlike anything else in the world. This allows us to achieve the desired test modes including Curb/Soil trip, Ramp (multiple ramps available), Fall-Over Ditch and GLONASS related activities. 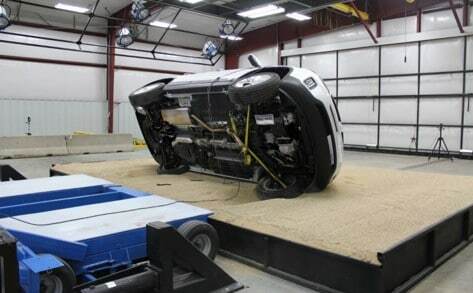 Additionally real-world driving events such as “Steering Induced Rollover” are available using special driving areas and robotic driving systems. Over the years, these different industry tests have helped our team to build expertise of how vehicles react within the different test modes. This allows the team to make knowledgeable judgements about parameters needed to achieve specific test results; helping our customers to minimize the size of their test matrix based upon this experience.